Successful warehouses are models of operational coherence. These spaces are a powerful blend of simplicity and efficiency where every square foot represents a real cost, and is treated as such. Warehouse operators can maximize their space, improve human workflows, and increase profits with proper equipment, storage, and management solutions.Successful warehouses are models of operational coherence. These spaces are a powerful blend of simplicity and efficiency where every square foot represents a real cost, and is treated as such. 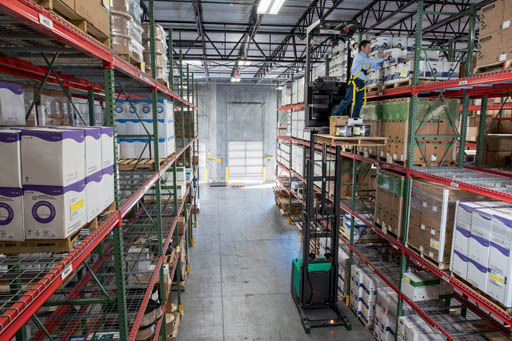 Warehouse operators can maximize their space, improve human workflows, and increase profits with proper equipment, storage, and management solutions. These competitive insights and processes have never been more important. The National Retail Federation estimates that online sales will grow three times faster than in-store purchases in 2017. This growth could help spur an increase in warehouse development, and force businesses that are behind to quickly upgrade. Warehouse operators are looking for a smart and comprehensive approach that will simplify their vendor relationships and provide them access to industry leading equipment and insights. This is why we created the Atlantic Warehouse Concepts Division. This innovative wing works with startups and companies interested in relocating or expanding their material handling and storage facilities or strategy. There are three key elements that we focus on when we build a warehouse concept. The Right SpaceWe can create custom solutions that maximize revenue producing storage space. Our ‘smart space’ solutions include both new and used: vertical conveyors, modular office solutions, mezzanines, all types of racking and shelving, shrink wrap machines, dock levelers, and all associated warehouse safety equipment. These products make sure nothing goes to waste and that you can hadnle flexabilities in demand as well as keeping your environment safe. The Right Material Handling Working in conjunction with laying out the most efficient warehouse we try to utilize a company’s existing Material handling equipment whenever possible in order to make the process as cost efficient as possible. We also may recommend the purchase or leasing of new or late model used equipment that will work more effectively in the space provided by the warehouse layout. In addition, the process of order picking is pivotal to a warehouse. Every single touch point is an opportunity cost and the process of moving consolidated pallets or single cases needs to be streamlined.Our team is trained to help you pick better order routes and increase picker efficiency. We can limit touches with narrow isle forklifts. We can even offer a Warehouse Navigation system that works in conjunction with your Warehouse Management Program that can increase your overall warehouse efficiency by 25%! We offer many world class forklift products from Jungheinrich, Caterpillar, Mitsubishi, and Marriotti to reduce costs and maximize value. Atlantic Lift Truck is an industry leader with a depth of experience helping businesses execute their warehouse needs. We strive to deliver excellence in everything we do. If you are interested in getting in touch with our Warehouse Concepts Division, you can visit us here.